The 95% confidence interval on the estimate of the rates are from a summary web page and are in change per 1000 generations. Those marked with F are unknown, but are probably faster than the nominal rate of 2 per 1000 generations. The ones marked with * in the name are sometimes discounted as being fast. A paper parameterizes the mutation rates by: 3.1×10-6 × e0.200 ×M - 1.06 × |δ| for increase, and 4×10-7 × e0.302×M - 1.06 × |δ| for decrease, by δ from the marker value of M. A nomenclature change adjusted by 1 downward all the 464x on May 19, 2003: the values here are in the new scheme. The 389-2 nomenclature used here is the length of the entire 389 region including 389-1. The notation is in FtDNA notation, by the NIST standards, 442 should be 19, and GATA H4.1 13. CDY is also called DYS724. From the markers, I was classified as a R1a(M17) individual and I was classified as belonging to haplogroup R1a1a by SNP typing (M124-[xR2a] M157-[uncommon] M269-[xR1b1a1a2] M343-[xR1b] M56-[uncommon] M64.2-? [uncommon] M87-[uncommon] P25-[unstable xR1b1] SRY10831.2-[R1a1] M17+[R1a1a] M173+[R1] M198+[R1a1a] M207+ [R]; later I also verified M94+[BT] M42+[BT] M299+[BT] M139+[BT] M294+[CT] M168+[CT] P143+[CF] ), just like 72% of the West Bengal Brahmins: see here for a basic idea of how a Single Nucleotide Polymorphism test works. (Further testing showed I am actually R1a1a1b2a1a2c Y7 with additional Y30, Y29, Y944, and Y2428, but not Y16494 (which is provisionally R1a1a1b2a1a2c2d5~xa); looking at the pattern of my close STR matches, I suspect that 12 marker matches may define only upto R1a1a1b but no shallower). As shown in this diagram, before the cladistic nomenclature started, it has been variously named as belonging to haplogroup 3, IX, 1D, 45, Eu19, H16, or D, according to classification systems adopted by various authors. Obviously a difference in a slower mutating site like 392 could count as much as 14 times a mutation at a faster moving site like 439, but I ignore that in the following discussion. According to Family Tree DNA site, no one with this exact profile has been tested by them yet. An ancient DNA from a Siberian mummy more than 3000 years back is, however, a 12 marker match for me, but see there for a discussion on whether that may be coincidental. A 9 marker (19,388,389I,389II,390,391,392,393,439) exact match for me is very common (10% of R1a1a) in Kyrgyzstan, and 12 marker matches (the first 12) has been seen in 1.5% of people represented in the YSearch database originating from Kazakstan (1/66; 95% exact binomial confidence interval on percentage [0.07,8]), 0.9% from Pakistan (1/108; [0.02,5]), 0.8% from Russian Federation (19 Altai(Siberian)+1 Kirghiz / 2357; [0.5,1.3]), 0.3% from Slovakia (1/367; [0.007,1.5]) and India (3/1107; [0.05,0.8]), 0.2% from Greece (1/534; [0.005,1]) and Mongolia (1/575; [0.004,1]), 0.1% from Hungary (1/786; [0.003,0.7]) and Ukraine (1/1049; [0.002,0.5]), and a sprinkling from Scotland (1/7719; [0.0003,0.07]), Germany (1/8388; [0.0003,0.07]), England (2/17101; [0.001,0.04]), and Ireland (1/9618; [0.0002,0.06]). The confidence interval in each case reflects the effect of only a small number of people having been tested: thus, if the true percentage of people of Russian origin who are a 12/12 match for me is outside the range 0.5–1.3%, the chance of seeing a large enough sampling fluctuation that we observe 20 matches out of 2357 randomly chosen people from a large population of Russians would be less than 5%. But, the actual population tested is not a random sample: the majority of the Siberian matches may have been from the Mendur-Sokkon village in the Ust'-Kanskii region in the southern part of the Altai republic. Similarly, people who got tested may be related in socio-economic and geneological ways: for example, the population from India that is tested may be skewed towards the group that resides in the US today. In addition, people report their origin in idiosyncratic way: so while some Englishmen report it as England, others will call themselves from the UK. Finally, with itinerant groups like gypsys, the country of origin is not a stable marker over long periods. The numbers here should, therefore, be interpreted cautiously. At distance one, we find 7% from Kyrgyzstan (1/14; [0.2,33]), 4% from Slovenia (4/101; [1,10]), 2.8% from Pakistan (3/108; [0.6,8]), 2.2% from Slovakia (8/367; [0.9,4]), 1.5% from India (17/1107; [0.9,2]) and Iceland (2/135; [0.2,5]), 1.2% from Bulgaria (1/84; [0.03,6]) and Canada (2/170; [0.1,4]), 0.8% from Norway(8/952; [0.4,1.6]), 0.7% from Denmark (4/587; [0.2,1.7]), Russian Federation (12 Altai(Siberan) + 4 others / 2357; [0.4,1.1]), Syrian Arab Republic (1 Arab/152; [0.02,4]), and Uzbekistan (1/152; [0.02,4]), 0.6% from Lebanon (1/154; [0.02,4]), Hungary (5/786; [0.2,1.5]), Lithuania (1 Askenazi-Levite + 3 others / 699; [0.2,1.5]), Greece (3/534; [0.1,1.6]), and Poland (1 Prussia + 13 others/2535; [0.3,0.9]), 0.5% from Austria (2/389; [0.06,1.8]), 0.4% from Ukraine (4/1049; [0.1,1.0]), 0.3% from Mongolia (2/575; [0.04,1.3]) and Czeck Republic (1/385; [0.007,1.4]), 0.2% from Germany (15/8388; [0.1,0.3]), Sweden (2/1213; [0.02,0.6]), and Italy (4/2479; [0.04,0.4]), 0.1% from China (1 Chinese Ethnic Minority/897; [0.003,0.6]) and United Kingdom (1 Great Britain, 1 Shetland Islands and 2 ohers / 7722; [0.01,0.1]), and a sprinkling from Spain (1/2292; [0.001,0.2]), Ireland (4/9618; [0.01,0.1]), Scotland (3/7719; [0.008,0.1]), and England (6/17101; [0.01,0.08]). A small note on the timing issues for these matches: the previous calculations show, for example, that the chance is less than 5% that descendants of two brothers will have a 12 marker match 62 generations later. But, if enough of those descendants all do their DNA tests, then it is almst certain that some matches will be found. So, once we search a large database like this, we may often find ancestries deeper than the calculations naïvely suggest, and the last common ancestor with many of these people may have lived longer in the past. The security modal haplotype (i.e. the ‘catch all’) of the modal R1a haplotypes listed by the Scandinavian Y-DNA project is close (1 difference in 14 markers carefully chosen to represent R1a). I am almost equally distant to the specific modal haplotypes: the Eastern European one is closest at a distance 20/37, and the rest are at distances of 21/37 (English, Eurasian, and Old Norse) or 22/37 (Ashkenazi-Levite). A naïve calculation indicates the last common ancestor was between 5 and 159 generations back, at 99% confidence; but since these are not random sequences, rather they were chosen because they are modal, the estimates may be skewed. The 393:13 426:12 388:12 392:11 455:11 454:11 437:14 438:11 also appear as slow mutating markers among the R1a1 in Bornholm, Denmark (Descendants of Henning Andersen b.c. 1627, d.c. 1709). The 426:12 388:12 455:11 437:14 448:20 YCAIIa:19 442:14 438:11 also appears in R1a from Baltic to Northern India, and 426:12 388:12 392:11 464b:15 464c:16 464d:16 YCAIIa:19 438:11 appears in Ukraine to Scotland-Poland. And the 19:16 388:12 389I:14 389II:32 390:25 391:11 392:11 393:13 439:10 (and A7.2:10) is the median markers among the R1a1a in Kyrgyzstan. The following is from older information: 12/12 matches were found in Austria-Hungary(1/151), Greece (1/312), Hungary (1/385), India (3/793), Ireland (1/5460), Kazakhstan (1/38), Mongolia (1/574), Pakistan (1/66), Russia (19 Siberia/Altai + 1 Kirghiz out of 1827), Scotland (1/4382), Slovakia (1/221) and Ukraine (1/558). One each from Austria-Hungary, India, Mongolia, and 3 of unknown origin, and all 20 from Russia had their haplogroup determined to be R1a by an SNP test. Matches at distance one (95% CI for last common ancestor of 5–121 or 6–148 generations depending on the model and assuming the slow mutation rate) are from Austria-Hungary (1/151), Bulgaria (1/30), China (1* chinese ethnic minority/677), Czechoslovakia (1/130), Denmark(1**+2/335), England (2/10167), Germany (1*+1**+8/4628), Greece (3/312), Hungary (1/385), Iceland (1*+1**/130), India (6*+1**+5/793), Ireland (1/5460), Italy (2/1140), Kyrgyzstan (1*/10), Mongolia (2*/574), Norway (1*+2/511), Pakistan (1/66), Poland (5/1170), Prussia (1/159), Russia (1*+1+12* Altai(Siberian)/1827), Scotland (1*+1/4382), Shetland (1/141), Slovakia (1**+6/221), Slovenia (1/46), Sweden (1/680), Syrian Arab (1*/129), Ukraine (2/558), United Kingdom (1/3405), United States (1/555), and Uzbekistan (1*/147). 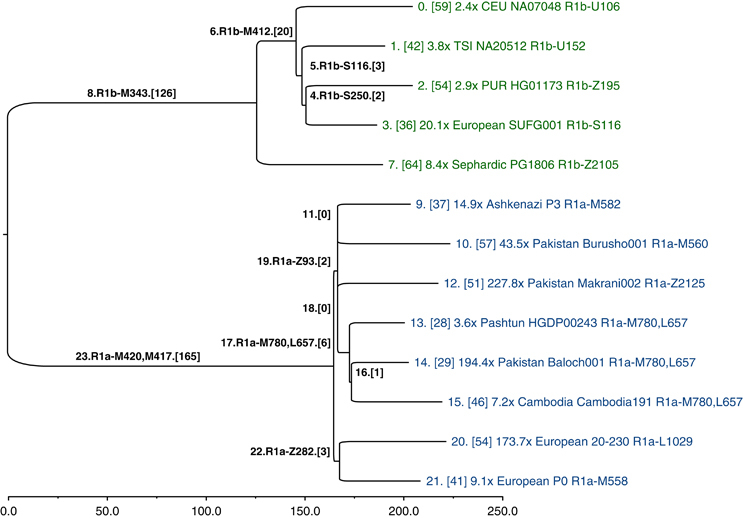 The asterisked numbers (and 2 of unknown origin) in each case had their haplogroup confirmed as R1a (** is R1a1) by an SNP test. Some details about more distant matches are here. In the lists below, a number of Y SNPs, are referred to. Both ISOGG and Yfull provide phylogenies for these. In modern browsers, these trees will be displayed (after processing) in the windows below. The early history is roughly given by the following: Y-Adam (~60–90Kabp) → A0-T → A1 (~140Kabp) → A1b (~110 Kabp) → BT=A1b2 (~55Kabp, NE Africa) → CT → CF (~31–55Kabp, NE Africa) → F (~60–80Kabp, out of Africa) → GHIJK → HIJK → IJK → K (~40Kabp) → K2 → K2b → P=K2b2 (~35Kabp, Central Asia) → P1=K2b2a → R=K2b2a2 M207 (~27Kabp, Asia) → R1 M173 (~18.5Kabp, SW Asia) → R1a M420 (Eurasian Steppes or Indus Valley) → R-SRY10831.2/Page65.2/PF6234/SRY1532.2, R-M448/L122/PF6237 and R-M459/PF6235 are R1a1, R-L120/M516/PF6236 is roughly here → R-M17, R-M198/PF6238, R-L168, R-M514/PF6240, R-M515 and R-M512/PF6239 are R1a1a, R-L12, R-L235, R-L399, R-L450, R-L451, R-L457/PF6191, R-L458, R-L579, R-Page68 roughly here → R-M417 and Page7 are R1a1a1, → R-CTS7083/L664/S298 (and CTS4385?) marks R1a1a1a (Northwestern branch) and R-S224/Z645, R-S441/Z647 (and CTS5508, CTS9754, PF6162, PF6168, F3044?) marks R1a1a1b (Eastern branch). This brings us to the approximate limit of 12 STR resolution (5±0.5kabp). Migration map of R1a1a1 according to Eupedia. 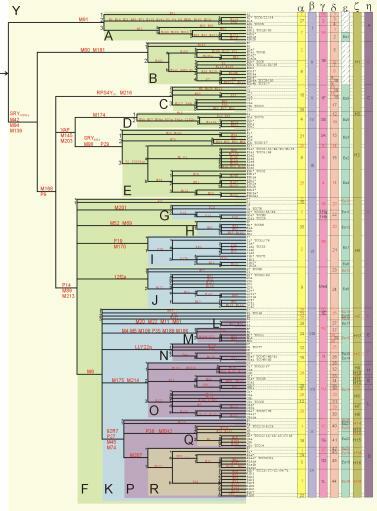 A low resolution Y chromosome phylogeny inferred in a recent paper. If browser supports, Yfull data reformatted to highlight relevant SNPs. The data is copylefted, scroll the window to top to see copyleft notice. Tooltips provide age information when available. The tree can be reformatted to display other sets of SNPs: instructions at top of the window. If browser supports, ISOGG data reformatted to highlight relevant SNPs. The data is copyrighted, scroll the window to top to see copyright notice. Tooltips provide information about the SNP when available. The tree can be reformatted to display other sets of SNPs: instructions at top of the window. John Jay Hemskey: (R-M459; tested R1a) A Helmskey (or Zehempsky/Zhomiski/Zemskey/Hempsky; descendant of Mikel Zehempsky/Zhomiski who died around 1945 and was from Poland/Austro-Hungarian empire around Galicia) family member described her relatives thus: ‘[he] was olive complexioned with black hair and brown eyes. However; many people commented on his "looking Jewish. "’, ‘you guys all look "Chinese! "(Almond eyes, and my Aunt [...], the youngest @ 5ft. tall with a size 4 shoe!) Very Asian in appearance!’, ‘My Grandpa [...] - - was quite fair, round head, no wrinkles at the time of his death in [...] at age 98. Also, VERY Almond-eyed, deep set and a gorgeous Blue’ and ‘someone said we had "an Indian" in the Family’. Vinesh Kavassery:(R-M417) The Kavassery family is from India, now settled in Dallas, Texas, USA. Yerzhan Aisabayev:(R-M417) The Aisabayev family is Kazhak in origin and is now settled in Paris, France. He is a direct descendant of Rainbek (born 1705) whose grave and memorial complex is baed in the city of Almaty. Most of Rainbek's descendants are located 200–300 km to the southeast in the villages of Karasaz, Sarjaz, Narynkol and a couple of others, all names tracing back to their Oirat (sometimes referred to as Kalmyks, their prominent decendants) heritage. Rainbek was at least the third generation in that region, and he and his army resisted the Dzungars, a collection of Oirat tribes. Yerzhan's father was born in the area of Issyk Kul in Kyrgyzstan. Manoj Piplani:(R-M417) The Piplani family is a frontier Punjabi Kshatriya Arora family of Kashyapa gotra from Mandhra village in Dera Ismail Khan district of the North West Frontier Province of Pakistan. Their extant genealogy goes back to 1597, when their ancestors were still residing in this village, but the -lani suffix in their family name hints at a connection with the people residing in today's Sind province. Gabor Mehes:(R-M417) The Mehes family had members who fit ‘the picture of an Indian male with medium height. black hair and slightly darker complexion than the average Hungarian and [his daughter] was similar in colours. [His son] on the other hand resemble[s] more ... [the] German ancestors through [his wife] with fair hair and blue eyes’. Danny Evatt: (R-M198; R1a1*) The Evatt family had a page on the web, in which in the author explained ‘that [the] family came to America in the 1600's from England where [one] can trace [the] lineage back to the 1200's. [The author guesses] before that [they] were Vikings invading England in the 1100–1300's. Before (and now according to the DNA) [...] relatives lived in Central Asia’. This page is now gone. The earliest mentioned ancestor is William Euot b.c. 1280 in Licolnshire, England. D. Endekina is no longer listed at the site. Bernard Leonard Barron: (R-M417) Originated in Slovakia; from Martin Andrew Barran-Parany b. 1876 d. 1941. Vinson Martin Bukowsky (R-M198) (tested R1a1) of the Bukowsky family from Texas whose paternal ancestor Gustaf Antone Bukowsky was born in 1864 in Germany. The surname is from Bavaria, and a toponymic surname Bucho- (beech) -wiecki is Polish. He, however, lists the earliest known male ancestor to be Richard Lockwood who lived c. 1540–1590 in Essex, England, and whose descendant moved from Combs, Suffolk, UK to Watertown, Suffolk, MA in the seventeenth century, and thence via Fairfield, CT, Worster, MD, and Bourbon, KY to Manor, TX by the 19th century, and where the descendants were still living in the 20th century; which is listed on the Lockwood DNA project patriarchs page, but not with the DNA results. Samuel David Holmes. He is no longer listed at the site (but there is a private match with name Holmes (R-M512)). Douglas Clifford Newman. (R-M417) He is probably the DC Newman who is an outlier among the Newmans at Newman DNA project. Most Newmans seem to be R1b1b2. John Darrel Cherry Jr.: According to this genealogy site, the Cherry family located in Texas after migrating to Pennsylvania; then Lincoln county, North Carolina; and then to the Lookout Mountain area in Chatooga county in Georgia. He is no longer listed at the site (but there are two private matches with name Cherry(both R-M417)); but the Cherry DNA project lists a William Anderson Cherry b 1817 (1815 according to the genealogy) as the ancestor of someone with ths STR profile. According to the familytreedna genealogy, this family is descended from Robert Cherry b 1685. For some reason the oldest paternal ancestor is listed as John Blacock b. 1776i, who doesn't appear in the genealogy. Lani G. Duncan:(R-M198) Probably for father Robert Dwight Duncan Sr. Aug 31 1925–Jan 29 2008, son of John Roland and Lois Marsh in Omak, WA. She probably posted asking about ‘John b ca 1795 Mass, Elijah Alvin b ca 1815 Vermont, Alvin b 1848 Wisconsin. John and Elijah moved to Wisconsin ca 1845 and lived near Hickey, Knapp and Cowan families. Alvin and some of his children wound up in Clay Co, Iowa and then onto Minnesota.’ On FTDNA she lists John Duncan abt 1815–1855 of USA as the earliest ancestor and his 37 marker 13/25/16/11/11/14/12/12/10/14/11/32 15/9/10/11/11/24/14/20/32/12/15/16/16 11/11/19/23/16/15/19/18/35/38/13/11 is 16 steps at 10, usually fast moving, locations, which is probably closer to 1500 than 3000 years back. A compilation of many a Duncans is available at the Duncan Roots website. According to them, and the Clan Donnachaidh DNA Project, this R1a1 is an outlier amongst their already rare R1a1's: most members are R1b1b2. Ronald Wallace Newman: (R-CTS2243; tested R1a1) He is probably the RW Newman listed at the Newman DNA project. The pedigree starts with an Edward Newman, born around 1803, who died in Hargrave, Suffolk, UK. Joseph Svienty: (R-M417) From the Zamagurie Region DNA Project for Former Spis County Eastern Slovakia and Poland Border Villages: The most distant ancestor is Simonus Svienty, 1765–1834 from Niedzica. The 37 marker 13/25/16/11/11/14/12/12/10/14/11/32/ 14/9/9/11/11/24/14/20/32/15/15/15/15/ 11/11/19/23/16/16/17/20/34/34/14/11 differs from mine by a total of 23 steps at 11, mostly fast, positions: possibly a last common ancestor closer to 1500 than 3000 years back. Nurlan Mambetov KG: (R-M417) Found on the web (and also partly at Z4QCH@Ysearch) that his paternal line is from Bishkek, Kyrgyzstan and that he comes from the paternal (Акесы) Sayak Kyrgyz and maternal (Aнасы) Sadyr Naiman Kazakh heritage. William Edward Serchak (R-M417) Family from Poland. Earliest known paternal ancestor Michael Jezierczak 1841–1915. Lászió Dorók(R-M512) Most distant paternal ancestor Dorók, Jászság, Hungary. Mederbek Sarbayev(R-M512) Most distant paternal ancestor Saribaghish (kirgyz), KG. Róbert Kármán(R-M417) whose ancestors are from Jászberény in Hungary. Vitaliy Slyadnev (R-A7015) whose most distant paternal ancestor is Petr Sergeev Slyadnev from Oboyanskiy uezd in 1694. Jason Christopher Booth (R-M417) whose most distant paternal ancestor was Captain James Booth b. abt. 1709 possibly in Wales d. 1778. He belongs to the Minneapolis, MN Booths and the last name is also spelt Boothe. Uri Sharf (R-M417) who is a descendent of Zvi Moshe. Three Kyrgyz tribes (Sari-Bagish, Saruu, Adigine) from "Umuraki, Bishkek ataul, kyrgyzs, Sari-Bagish clan", "Inka, Cholpon-ata ataul, kyrgyzs, Saruu clan", and "Alay ataul, Kazike, kyrgyzs, Adigine clan" are a match (R-M512). In addition there are private matches with names Koshenov, Maffett(R-M512; from William Norris), Tek (R-M512), T.K. (R-512; Koshimbai of Baibaqty of Saruqyrgyz of Kazak) and 073-B001(R-M512). (A post about matches to Nurtan Mambetov KG, shows one of the names as T K Koshenov.) There is also an 11/11 match with Dennis Maule (There was a bug in uploading that omitted 389-2 and inserted a fake DYS 19b=DYS19/394, this ysearch account seems to have that), descendant of Riccardo Maule (c.1890–c.1956) from Vincensa, Italy. Ancestry.com finds two 10/10 matches for me with Cathy Warren and Zachary Kurek which they interpret as having a last common ancestor about 15 generations back. They also find numerous other matches with the predicted common ancestor 31–35 generations back. Not updated: A match at distance 1/12 happens with Harish Radhakrishna Kamath (no longer on the site, but a private match exists with this name), with the most distant known paternal ancestor is Raghavendra Kamath 1913–1989 from Karkal, and he is R-Z94. The Kamath family, who are a Gaura Saraswat Brahmin family from Mangalore whose family tradition says they moved from Kashmir to Trihotapura in Bengal and around 500 AD moved to Goa from whence they moved to Mangalore after the Portuguese started administering that region. A 37 marker test shows that there are 12 markers which are different, and the total difference is 22 in the stepwise mutation sense; but since all except one of the multiple differences is at faster varying sites, the relevant result is probably that 14–15 mutations in 37 generations has a 95% confidence interval of between 10 and 125 generations without convergent or back mutation correction, not correcting for the fact that the match was found by the search of a large database. Someone related to Ms. Susan Colby (descendant of Jurgen Kolbe b c 1675, Angermunde, Brandenburg,Pr; R-Z283), and many other families: Balda (Ramesh; R-M417), Barker (Jordan Cheyne; descedant of Thomas Madison probably 1941 IL; R-M512), Berezik (private match; from Antonio Berezik, b.c.1785, Lesko, Poland; R-M512), Berezik (private match; from Antonii Berezik, b.c.19th c., Lesko, Poland; R-M512), Bergtun (Dag Harald; most distant Knut Eriksen Rakvåg,b. c. 1695,Rakvåg,Oterøy,Romsdal,MRO,Norway; R-M198), Bialkowski (Jacek Piotr; descendant of Franciszek Bialkowski c 1790–1856 Swidniki, Pols; R-CTS3402), Cholewa (private match; from Henryk Cholewa, b. 1885, Tarnawa, Poland; R-Z280), Cremer (James Clarence; from Thomas Cremer b. c.1832? 1835? Hanover, Germany; R-M198), Dibek (Mithat; most distant from Bulgaristan; R-M512), Dixon (James Robert; descendant of John Dickson c 1775–1836; R-Z280), English (private match; [E11] Strickland English, c.1805–aft.1860, Vermont, USA; R-Z93), Ermolenko(Petr Efimovich; Ivan Ermolenko 1740–1760; R-512), Fox (Stephen Lynn; most distant ancestor Gottlieb Fuchs Dec 1846–19 Jul 1903 from Germany; R-M512), Gyetvay (Mark; from Hungary; R-M198), Hall (Joshua, great-great-grandson of Henry, descendant of John Hall of Hunslet c 1780, Leeds, England; R-M417), Hallai (Julian, no longer listed; but a private match with that name from Jozsèf Hallai 1875–1916, Kisiratos, Hungary; R-M198), Hasan (A.M.; R-M512), Herman (Jason Christopher; from Frank Herman, 18 Feb 1888–1 Apr 1954; R-M512), Higgs (Harold; from Peter Rollason b. 1760?, Warwickshire, U.K.; R-CTS4179), Higgs (Marvis E.; from Peter Rollason b. 1760?, Warwickshire, U.K.; R-L176), Houghton (Christopher; R-M417), Irvine (David Peter Gerard; from Samuel Irvine, 1789, Limavady, County Londonderry; R-M512), Kadyrbekov (Zamirbek; R-M417), Kennedy (Donald Grinker, descendant of Abraham Kennedy, b c 1858, Vilnius, Lithuania; R-M417), Kozhomuratov (Edyl; R-M512), Kozhoyarov (Sharshenaly; R-M417), Kulbayev (Torekhan; Babasan tribe of Northern Kazakhstan; R-M417), Kurek (Zachary Michael; descendant of Joseph Kurek b c. 1879 in Czekoslovakia; R-M417), Kutbi (Tharwat; from Jameel Ibrahim Kutbi; R-L657), Larsen (Kurt P.; most distant Lars Nielsen 1718–1800 of Tise, Borglum, Hjørring Amt, Denmark; R-CTS4179), MacDonald (David; earliest known ancestor b.c. 1795, possibly Virginia; his son John b. 1828 Tennessee d.c. 1880 Texas; R-L176), MacDonald (Donald John; R-M417), MacDonald (private match; from John McDonald, 1786; R-M512) Maksutov (Nurlan; R-M417), Malik (Tariq Murtaza; of Awan Malik family), Mantor (Donald Duncan; from Samuel Duncan, 1619–Apr 1680; R-M417), Matheson (Alister Hugh, no longer listed; but a private match of that name; R-M512), Mathieson (Malolm B.; most distant known ancestor is James Matthieson b. 1826 at Paisley, Scotland), McDonald (Neill Flemmon; from John Norman McDonald; R-L176), McEachern (Carlton Leslie; R-L176), Meszaros (Anthony Joseph; descendant of Istvan Meszaros b 1856 in Nyirlugos Kerekn%aacute;d, Hungary; R-L579), Miclash (Robert; R-M417), Mughal-Pathan (Yasser Khan; descendant of Abdulla Khan Mughal-Pathan) Onus (Curtis; R-M417), O'Reagan Cook (Dr. John Michael, M.D. ; descendant of Alexander Cook), Passarella (Richard; R-M417), Psaltopoulos (Dimitrios Vassilios; most distant Lazaros Psaltoglou from northern Turkey; R-M417), Rao (Varun Shankar; descendent of Venkayya b.1830; R-Y7), Rickerl (David; descendant of Michael Rückerl b. c. 1750 of Germany; R-Z280), Rollason (private match; from Peter Rollason b. 1760?, Warwickshire, U.K.; R-CTS4179), Runnells (Martin George; descedant of Thomas Runnels, b 1790 VA or KY), Ryskulov (Uran; R-M512), Samakov (Aybek; R-M459), Samarkin (from Dei Samarkin Samarsky uezd, Erzya, Russia; R-M417), Sanasy (Vijayakumar; Murugesu, 1876–1944; R-M417), Seroka (Wladislaw; from Mieczyslaw Seroka, Lublin province; R-M512), Seyit (Abuov Omar; of Omar from Seyit from Azhibai from Aidar from Kete; R-Z93), Seyit (Aidyngaliev Alkerey; of Alkerey from Seyit from Azhibai from Aidar from Kete; R-M417), Seyit (Kojanov Alseyit and Gazezov Alseyit; of Alseyit from Seyit from Azhibai from Aidar from Kete; R-M512), Shomin (Bernard Noel; from Juro(George) Nicolai/Nicolas/Nicholas Šomin; R-M417), Skvortsov (Vitally Denysovych; descendant of Porfyriy Skvortsov, b. c.1865, d. c. 1920 Radalivka, Ukraine; R-Z92), Sydykov (Azamat; R-M198), Tagankin (Vladimir Cladimirovich; descendant of Alexandr Tagankin c. 1890), Turner (John Wendell, descendant of Jeremiah 1773 VA–1872 KY; R-M198), Usubali (Marat Shertai; two kits; Solto-Tœlœk; R-M512), Velikoselski (Olag; descendant of Ivan Velikoselskiy, b. c.1580 in Novgorod-Tomsk, Russia; R-Z280), Windsor(John David; John T Windsor 1839–1924 from previous Stapleton? Z2122+ if correct would make him R1a1a1b2a2b; R-Z94), and the family of Dr. P.S. Ramanujam (descendant of Venkatacharan) also appear at a distance of 1/12; as do many people at much closer distances also appear in the ySearch database. Similarly the match at a distance of 2/25 with Marwan Aladnan (R-L657), Fazim Mohammad (R-M512) and Varun Shankar Rao (R-Y7; descendent of Venkayya b. 1830; with ancestors as Ramaswamy of Kuthalam, Tamil Nadu, Rao of Mangalore, Karnataka, and Venkateswaran of Palakkad, Kerala) may not be particularly significant. As stated earlier, looking at the distribution of haplotypes, a 12 character almost match cannot distinguish the clades under R1a1a1b. Sorenson molecular genealogy foundation claims 6/7 (DYS 393,458,459(only one),455,454,464,456) match with Webb (descendant of William Smith Webb, b. 18 Mar 1818 in Virginia) and another 6/7 (393,394,not 458,455,437,449,442) match with Mitchell (descendant of William Michell b. 11 Jul 1842, whose son Thomas b. 14 Jan 1874 was born in Frontenec, Ontario, Canada). Ybase also finds a number of matches.